“If I had to pick one lesson that I have learned in my life, it would be the importance of remembering that God always speaks to us. During the good and bad times, God walks with us to rejoice or lend a comforting hand,” explained Sister Josine Mondloch. Sister Josine needed to make a decision about high school, and it happened that one of her classmates knew one of the Hospital Sisters from St. Nicholas Hospital, Sheboygan. This Sister invited a small group of girls to visit the Motherhouse in the Spring of 1946, at which time they also learned about the Sisters’ St. Francis Convent High School (for young girls considering religious life). The visit to the Motherhouse made a positive impression on Sister Josine, and upon her return to Sheboygan, she made the decision to enroll in August 1946. During her years in St. Francis Convent High School, she completed basic high school education, and entered religious life on February 2, 1949. She later made her First Profession on October 4, 1951. She is a graduate of St. John’s School of Nursing, Springfield, and she also earned a Bachelor of Science degree in nursing from Marillac College, St. Louis, MO. She served as a medical staff nurse and operating room nurse manager at sponsored hospitals of St. Francis (Litchfield), St. Mary’s (Decatur) St. John’s (Springfield), Sacred Heart, (Eau Claire) and St. Vincent (Green Bay). She also served in the admitting department at St. Nicholas (Sheboygan). In addition, Sister Josine has held various positions at the Motherhouse including Health Office Coordinator and Assistant to the Motherhouse Coordinator in the care of the retired Sisters. 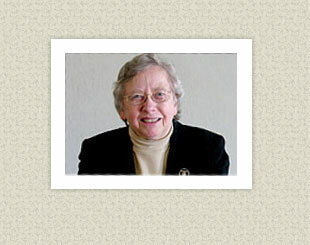 She also served at Hospital Sisters Health System as the Assistant to the Vice President for Wisconsin Hospitals. Currently, she is a volunteer at Hospital Sisters Mission Outreach where she brings her knowledge of surgical equipment and supplies to use with the donated items. “As St. Francis reached out to the lepers who were rejected by society, we also reach out to our brothers and sisters to provide care that otherwise would not be available to them. Today’s lepers are the disenfranchised who are neglected by no fault of their own. They are those in the world who cry out for basic human needs such as a toothbrush, bar of soap, wash cloth, fingernail clippers to medical equipment and supplies that we take for granted,” she explained. The message of St. Francis and St. Clare for each of us today is found in what we must do for the Church, one another, and the environment. For Sister Josine, it is an opportunity to bring Christ’s healing presence to others. Learn more about Hospital Sisters Mission Outreach.